Applesauce has not always been a favorite of mine. The varieties I have had tended to be super sweet and a bit runny so I didn’t really eat it all that much. My son is a different story as he loves applesauce and will eat it in large amounts any time of day. 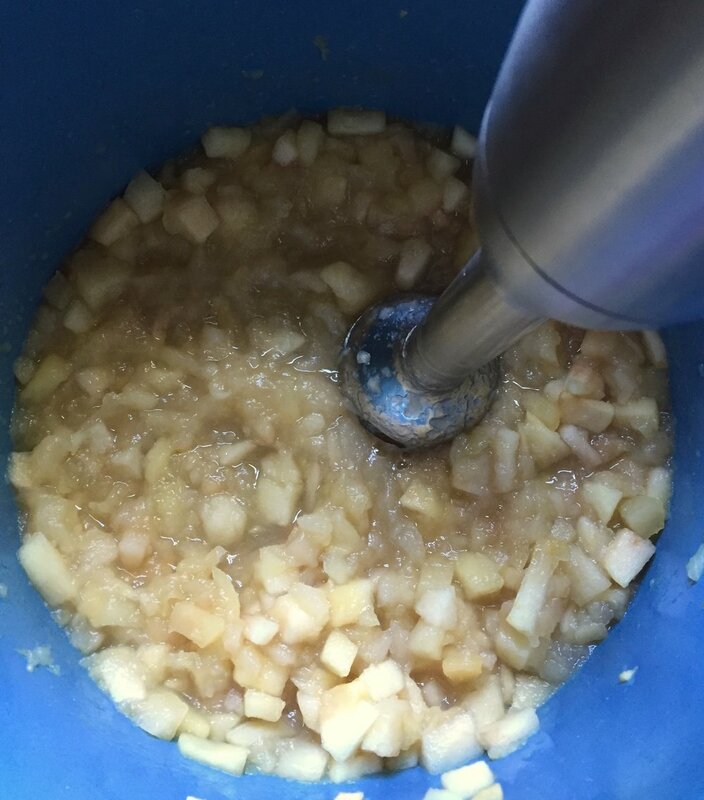 Since applesauce is a dish that really showcases the flavor of apples with almost nothing else added, I thought it would be a perfect ending to our Apples series to share with you my method for making applesauce. Discovering that you can make applesauce yourself has changed my opinion on it. Mine is smooth, thick but not too thick, sweet but not too sweet and the apples I used to make it really shine through in this sauce. Making it when apples are in season also saves me money since for a little bit of money I can make what equals jars of applesauce! Applesauce is easy to make. Peeling, coring and chopping the apples before they can become sauce does take a bit of time but is not hard at all! This is a perfect recipe to gather a few friends and some apples and have a wonderful time peeling, slicing and laughing! The icing on the cake is you all get to take home some, fresh from scratch applesauce that you brought to life with your own two hands. Applesauce really lets the apple show you what it’s made of and is a perfect way to give apples the spotlight in your cooking! Peel, core and dice apples into small pieces. Taste apples and add any additional sugar. This keeps for up to 2 weeks in the refrigerator but can also be canned and stored for up to 12 months. Use a mixture of sweet and tart apples in this. If you are unsure of what apples to use, my Pinterest board Helpful Food Charts includes a chart that shows some common varities and how to use them. McIntosh are great applesauce apples! Lemon juice is a great way to make sure your apples do not brown while you are peeling and cutting them. 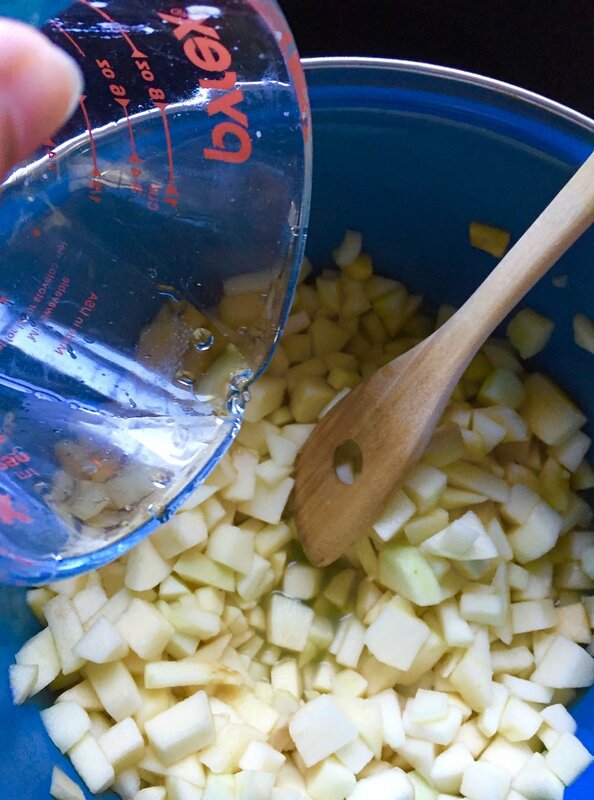 It can take some time to get apples all ready for sauce so it’s really important you add a bit of lemon juice to help you out. The consistency of the applesauce is completely up to you. If you favor a very chunky applesauce that has pieces of apples in it, you may want to skip the blending step and just mash a little with a potato masher. Tasting the sauce before adding more sugar is important since apples do have their own natural sugar and this will make the sauce naturally sweeter or tarter depending. You may find your apples need noting but a little water, a little sugar and a little time. Trust me that too sweet applesauce is not a good thing!